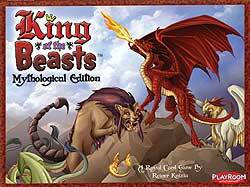 The mythological animals are battling to see who is the ultimate King of the Beasts. The dragon is the largest, the kraken is the strongest, the unicorn is the most enchanting, and the manticore and the gryphon are powerful in their own rights. Even the tiny fire salamander wants to be King! But who will win the most votes? Gain as many points as possible by nominating animals to be King, while still keeping some of the cards for your score pile. Once an animal becomes King, points are awarded - the player with the most points wins!